Uncategorized Archives - Page 2 of 6 - Informs Inc.
Let Informs help you take back control of your time and your money – for FREE! In this fast-paced world, with more than 50% of global web traffic originating from mobile devices* and data instantaneously at your fingertips, it’s time to evaluate your relationship with your mobile device. There’s no better time than right now to determine if this relationship offers the security, support and productivity you need to be your best. With data moving at lightning speed, don’t let your old device slow you down! Informs and Honeywell have joined forces to help you with this decision, and together, they offer the solution that is exactly what you need! As you analyze the relationship with your current mobile device, the critical question is safety. If your mobile device has outdated technology, you are susceptible to security vulnerabilities and exposed to breaches, due to outdated software, browsers and operating systems. Also critical to a symbiotic relationship with your mobile device is the ability to employ the latest hardware and security advancements. Without them, you run the risk of application testing that only covers current or major releases of smartphone operating systems and browsers. If your mobile device can’t run an enterprise application, it’s time to consider ending this relationship. In addition, factors such as loss of CPU and memory, reduced battery life and lack of storage impact your speed and productivity. Parting, especially with your very valuable data, can be such sweet sorrow, but the burden of parting ways can be eased considerably by cloud backup services and support. If you’re still on the fence about letting go, here’s a deal that will have you saying, “Arrivederci!” in no time! Right now, you can trade in your outdated device and save up to $200 when you purchase an eligible Honeywell Android™ mobile device through Informs! Experience speed, power and versatility when you upgrade to Honeywell’s Android™-powered mobile devices. Saying good-bye to your outdated mobile device has never felt so right or been so easy! If you’re ready to trade up and save, check out the list of qualifying products today! Wouldn’t it be nice if you could have the convenience of using a smartphone in your warehouse or plant? Zebra Technologies has the exact device you need. The TC52 and TC72 mobile touch computers are the ultimate enterprise-class touch computing devices. They are designed to be as intelligent as a smartphone, but rugged enough to survive harsh environments. Both devices run on the Android operating system. If you still haven’t created a migration plan away from your Windows OS, now is a great time to do it. Zebra has strengthened security features to make the Android OS enterprise-ready. On Zebra devices, all business data is private by default. You get full disk encryption, enforced security between apps, and a virtual private network. Zebra also provides patch updates. Zebra’s Mobility Extensions (Mx) are pre-installed on each device. The Mx technology provides extra security to areas where Android is vulnerable. It locks users into one business application, enhancing productivity and prohibiting access to other business or personal apps. You also get government-grade encryption and device lock features for accessories that pose security risks like USB, Bluetooth, or NFC. Moreover, your IT team has full control over app security, including app installation and access rights. Zebra upgraded the computing power for this new generation of mobile computers. The Android platform features the latest Qualcomm chipset (the Qualcomm Snapdragon™ 660 octa-core, 2.2 GHz). The chipset supports an extensive platform for application development. You’ll get a predictable roadmap for future development which will lower the total cost of ownership. The Qualcomm chipset assures a minimum of two Android OS upgrades, so your mobile computer will not be obsolete soon after your purchase. The platform can not only run all current data-intensive and voice applications now, but also comes ready to run new applications like Machine Learning and Artificial Intelligence. The TC52 and TC72 are extremely versatile enterprise devices. The TC52 is used for transportation, field mobility, and retail. The TC72 is recommended for warehouse management, manufacturing, and retail. Both mobile computers share many enterprise-grade features. With both devices, you get advanced touchscreen technology. They have displays with a multi-touch option that works when wet or with a glove or stylus. Capture 1D and 2D barcodes fast with advanced data capture scanning capabilities. Employees gain efficiency because they have extended range and the ability to point and click to capture data. They do not have to align the scanner with the barcode to complete a successful scan. You also get crystal clear audio and secure Wi-Fi with cellular network flexibility. Zebra’s Mobility DNA suite is included with every device. Mobility DNA is a comprehensive suite of tools for business, management, and development. The suite consists of applications, utilities, and tools you can customize. The two mobile computers have some differences. The TC52 can handle multiple 4-foot drops to tile over concrete between 14°F to 122°F and has a battery life of up to 14 hours. The TC72 can handle multiple 8-foot drops to concrete at room temperature and has a 15-hour battery life. If you need an enterprise-grade mobile computer, the TC52 and TC72 can give you a performance edge. Call us at 616-399-7010 or email us at info@informsinc.com to learn more about Zebra’s mobile computers. Don’t forget your printers. If you’re like a lot of companies, you know you have to manage your devices. Too often, this only includes your computers and handhelds. With so many mobile computers, scanners, and other hardware to keep track of, printers might not get much attention. But if you are not centrally managing your printers, they’re probably not being appropriately managed. A lack of visibility into printing operations could create serious problems for your company. Upgrades don’t get installed, mobile printers get lost in the shuffle, and it’s doubtful you know precisely how much each of your printers are actually used. Printers carry the same security risks as any other device that falls under IT; if you miss a new patch, you’re vulnerable to a security breach of your network. There’s also on-the-job issues to worry about. Since printers require precision tuning, you are also at risk if settings get changed, but IT doesn’t know it. This might lead to increased calls to a help desk and unsatisfactory future print jobs like illegible labels. Print just one batch of labels that is not provisioned correctly, and you run the risk of returned inventory and increased expenses. Zebra Technologies has the solution to make managing your thermal printers easy. Link-OS, Zebra’s innovative operating system for printer management, contains a powerful Multiplatform Software Development Kit (SDK) and a smart applications package to centralize the management of your printers. Zebra’s Print DNA suite offers a combination of applications, utilities, and developer tools. With Link-OS, you get an easy system to integrate and manage all the computers in your IT network. This includes printers for barcode labels, receipts, or passive RFID tags. You can remotely deploy, manage, and troubleshoot of all your Zebra networked printers, as data is stored in the cloud. Link-OS gives your IT team tighter control over your printer network—from deployment to management to maintenance. With real-time visibility, your company can manage printers with greater consistency and stronger security. Your employees benefit because they can use the Print Station app to print from anywhere using Android tablets and smartphones. Link-OS allows you to manage networked Zebra printers remotely from your browser. The real-time status of each printer is communicated through red, yellow, or green alerts. The alerts contain scannable QR codes to get access to support videos or other troubleshooting help. Link-OS printer connections are direct and encrypted. Zebra’s PrintSecure application makes it easy to configure printers to use secure connections, block unwanted access, and protect data. The permission control features allow you to define who has access and at what level. Link-OS also makes it easy to print directly from your ERP. You can print labels, PDFs, and other media from Oracle, SAP, and other ERP systems without middleware. The printer group functionality of Link-OS makes it easy for you to organize printers into groups with customized tags, check the status of the group’s printers all at once and configure or update as needed with just a click. Configuring printers is fast and easy. Link-OS groups more than 300 printer configuration settings into categories accessible via tabs in the browser interface. Locate the settings you want with one or two clicks. With Link-OS, you can gather device information stored on the cloud. This includes device locations, workload capacity, and information related to proactive maintenance to prevent downtime. Discover any printer on your network without having to physically locate it. 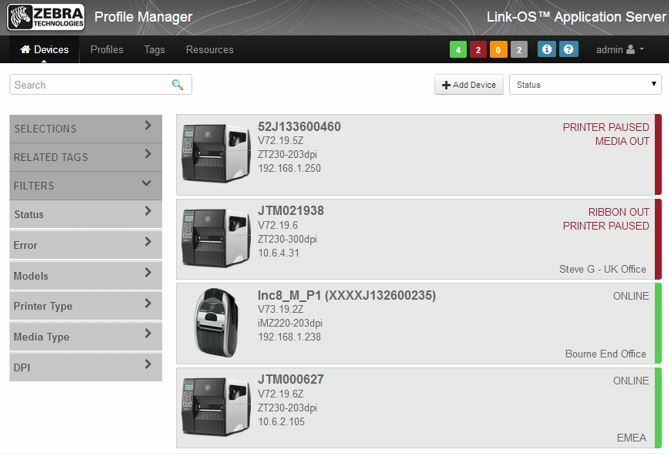 Link-OS printers pair easily with mobile devices and include SOTI and AirWatch MDM/EDM connectors. Link-OS allows you to flexibly schedule printer updates for when a printer is visible on the network or at a specific time and date. Create a library of custom profiles using Link-OS. Then, you can easily distribute those custom profiles to your printers anytime. Do you want to do a better job managing your printers? Call Informs at 616-399-7010 or email us at info@informsinc.com to learn more about Link-OS. It seems like not a day goes by without another news story reporting on the latest cyberattack. IBM estimates the average cost for a data breach is $3.8 million, according to the 2018 Cost of Data Breach Study. It’s no wonder companies are plowing money into cybersecurity efforts. Cybersecurity Ventures predicts companies will spend $1 trillion cumulatively over the next five years. Cybersecurity is a big issue no matter your industry. Cyber thieves are as likely to target manufacturers or a transportation and logistics company as they are to hit a hospital or a bank. Here is an overview of the threats you face as well as highlights of the various safety features from Zebra Technologies’ Androids to combat those threats. Bring your own device to work is now a common occurrence in workplaces across the country. However, there are all kinds of pitfalls associated with this policy, and many of the issues tie into cybersecurity issues across the board. For example, if you are a transportation and logistics company, you may allow your employee to use their personal device to track locations, navigate routes, set up your pickups and deliveries, etc.This puts your company at risk because it opens the possibility of the device getting locked with ransomware or suffering a network failure. If the device contains critical information that can’t be removed, you’re out of luck. The same holds for manufacturers. Like other companies, you face the possibility of employees inadvertently allowing rogue access to devices. Devices are also susceptible to the spread of malicious malware, and with any device comes the risk of intellectual property theft concerns. For example, if your company allows BYOD, your employees have access to confidential or proprietary data, designs, and processes. Even if the employee has a scrupulous disposition, there’s always the possibility that the information can fall in the wrong hands. Mobile devices are not always updated as they should be. Without updates, your devices have vulnerabilities because the security patches are not up-to-date. Your business has benefited from the rise of the Industrial Internet of Things. These types of machines run on seamlessly connected industrial networks.But that opens you up to all types of vulnerabilities: Hackers can gain control of a network and use a denial-of-service attack which can change your operational technology. If you have BYOD policies, it’s a wise investment to have an Enterprise Mobility Management solution to maintain control. Zebra’s BYOD solution is MobiControl, which they offer in partnership with SOTI. MobiControl allows organizations to manage, support, secure, and track both business and employee mobile devices. Android has come a long way from when people thought it wasn’t safe for enterprise use. On Zebra Android devices, all business data is private by default. There is full disk encryption, enforced security between apps, and a virtual private network with options. Your IT team controls app security, including which apps are installed and who uses them. There are device security features, including a hardware root of trust. Zebra’s Mobility Extensions (Mx) come pre-installed in every mobile handheld device. The Mx technology provides additional security to any areas where the Android OS is vulnerable. The Mx feature locks users into one business application, enhancing productivity and prohibiting access to other business or personal apps. You also get lock device features for accessories like USB, Bluetooth, or NFC, which can pose security risks. For files, you get government-grade encryption. You select the files you want encrypted and have centrally-managed encryption keys for protection. Finally, Zebra provides patch updates, so you don’t have to worry about security breaches. Mobile security is serious business. Don’t take it lightly. The team at Informs can help you spot your vulnerabilities and help you find the Zebra products that will protect your company. Contact us at 616-399-7010 or email us at info@informsinc.com to get started. Migrating to a new operating system for handheld devices might not be the most exciting thing on your to-do list. However, it is critical that companies form a migration plan now that Microsoft is in the first stages of ending the life of its mobile operating systems. Times are changing in the industry as a result. Windows Embedded Handheld 6.5 was the most widely deployed mobile OS in the world. Since Microsoft has decided to leave the enterprise market, companies must create a migration plan that will avoid any issues with operations and service. Informs recommends Zebra Technologies products powered by the Android OS. This article will help you figure out when you need to make a switch and describe some of the benefits that Zebra Androids can bring to your business. There are two key designations for Microsoft leaving the mobile OS market. The first is “End of Support.” Microsoft will stop issuing security patches and software updates when it ends support for an OS. If you are still using the OS to run devices, there is not a Microsoft solution for virus defense, software bugs, or the adding of new apps. Apps will need to be rewritten before any deadlines for a new OS. If you are in a regulated industry, this is an issue where you must pay close attention. The second designation is “End of Life,” when Microsoft will cease service of the OS. Since Zebra Technologies provides devices and other solutions in many industries, it made sense to seek out other possibilities when Windows support ceased to exist. When it looked like Microsoft was going to leave the mobile OS market, Zebra Technologies started working with Google on a possible alternative. Google’s Android OS had gained popularity since its inception in 2010 and was seen as a possible solution. One factor that was of concern with Android was security. Zebra and Google strengthened Android for enterprise hardware devices by creating secure architecture. Android made sense for Zebra, in part, because of the many benefits it provides its users. Android is the world’s most popular OS and is cost-effective. It’s likely that many of your employees already use Android on their smartphones and other devices. Since its inception, Android has become the dominant mobile OS in the world. One interesting stat on Android: It’s on four of every five consumer handheld devices. You can expect similar numbers for enterprise someday soon as companies now migrate to new devices and a new OS. Security and the protection of sensitive data are always important when dealing with an OS. Zebra has strengthened the Android with its Mx Technology; this means it is uniquely hardened for enterprise use. The Android devices are optimized for demanding enterprise environments. The devices powered by Android have data and apps protected by app locks, risk protection, and government-grade encryption. Android is an agile OS and easy to customize. It has a large development community for apps and is flexible for adapting to the unique demands of enterprise applications. Zebra includes its Mobility DNA suite of workforce mobility apps with its devices. The suite simplifies device management for enterprise. These enterprise-level apps are fully customizable. With the Mobility DNA suite, your apps will have greater connectivity through workspaces. Your developers will be able to customize your apps to fit your needs. Finally, from the looks of it, Android has staying power. Microsoft’s decision caught many by surprise. However, Android has been around since 2010, and its developers have continued to optimize the OS for enterprise uses. If you use a device with Android OS, it’s a safe bet it will be with you for quite some time. Whether it’s manufacturing, transportation and logistics, or warehousing, Informs can help you with your migration to a new OS. The TC8000 mobile computer can help workers with inventory management, supply line replenishment, maintenance/repair operations, and compliance verification. The ET55 tablet is rugged and can resist drops, water, and dust. It has 4G connectivity, so you can put it to work just about anywhere you’ll need it. The TC52 and TC57 touch computers are not only rugged for tough environments like manufacturing, but also have the intelligence level of your cell phone. You get world-class data capture, advanced touchscreen technology, and safe, secure Wi-Fi with cellular network flexibility. Our consultants and engineers can help you find the right devices for your needs or answer any questions you have about the transition you need to make soon. Call us at 616-399-7010 or email us at info@informsinc.com to get started.